WILLIAM SPRATLING, an innovative and talented designer of Mexican jewelry, silver hollowware, tin, copper, and furniture, demonstrated his appreciation for, and sensitivity to the early cultures of Mexico. He established a model for the artistic development and growth of the silver industry in Taxco and well deserved the title "Father of Contemporary Mexican Silver!" 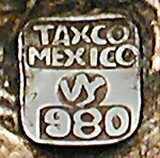 The study of the silver hallmarks and construction techniques used on Spratling's Taxco jewelry and hollowware designs is increasingly important! Spratling's designs have always been copied but now, perhaps because of the higher prices Spratling's name commands, copies of his designs AND replicas of his hallmarks are all too common in today's marketplace. See Hallmarks, What Do They Mean? Photographs of several examples of hallmark replicas (designed to deceive) have been included. IS IT AUTHENTIC OR A COPY??? Because of the more sophisticated techniques being used today for copying hallmarks, the section Tips on Collecting is one of the most important parts of this website! It is more vital than ever to be aware of the construction techniques, design periods, materials used, and other such issues. (Tips on Collecting discusses these topics.) If the hallmark "looks okay" but the construction technique seems inappropriate, or the design is inappropriate to the hallmark used, you may be looking at a copy rather than the "real thing." The section entitled Search for Spratling Items now includes more than 985 different Spratling items. Although this is the most complete compendium of Spratling designs to be found anywhere, It continues to expand, and hopefully, someday - with your help - will be complete. Use it not only to find out more about your specific Spratling treasure, but more importantly, to gain a sense of what kinds of designs and materials were consistent with which hallmarks. The "Search" database now presents items in a general chronological order according to when the design was first introduced. The items are not presented in the exact order in which Spratling introduced them, but rather grouped within a two or three year period of introduction. Therefore, if you search "Bracelets" as the only search criteria, those that appear at the beginning will have been introduced earlier than the 26th or 30th bracelet that appears. Those that appear at the end of category (bracelets in this example) will reflect those designs Spratling introduced at the end of his career. Remember, this is a general grouping, and does not reflect which bracelet was designed "first" or "second." The item actually pictured may not have been produced immediately upon introduction of the design. For instance, the design may have been introduced circa 1938 at a time Spratling was using the WS Print primary hallmark. If it was a popular design, Spratling may have continued to produce it until 1944 at which time the WS Print Circle was the primary hallmark in use. And the example we have pictured may bear the WS Print Circle hallmark. Nevertheless, this design has been grouped with other circa 1938 items since that is when the design was introduced. Within each category, Silson items are grouped together, and if any tin or copper items were made, they appear at the end of the category listings even though all copper and tin ware items were produced from 1931 until about 1945. Hopefully this will make it easier to identify style and design types with the appropriate general time frames. Each of the sections of this website listed in the "buttons" on the upper left of this page will lead you to more information and, hopefully, greater appreciation for the genius of Spratling. 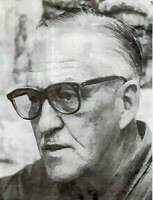 The research data for this website has come from Spratling's writings including his correspondence and office records, Spratling's catalogs, interviews with Spratling's contemporaries, writings and advertisements of the period as well as personal examination of many thousands of Spratling pieces. Many people have shared their information as well as access to their Spratling pieces. We now have more than 5000 records of individual Spratling pieces organized into a database that was created to facilitate analysis of this research material. Only a small part of that database appears on this website. We continue to discover new information that will refine the data presented here. Your comments, information, data, and dialogue are gratefully welcomed! This first design period necklace is one of the relatively few examples of Spratling's work that was not inspired by Mexico's pre-Columbian heritage. It appears that the design inspiration for this necklace came from the halo of the Virgin, a figure currently in the collection of the Museo de Arte Religisio in Mexico City. We find other examples of both jewelry and household objects in which Spratling used similar repoussed stars and repoussed sun rays. Spratling referred to this necklace as the Rubinstein necklace because it was initially designed for Helena Rubenstein. The design appeared in Spratling's wholesale catalogues from 1942 until 1945 although the above example was made circa 1939 as evidenced by its hallmarks WS Print later, Taxco Mexico, and 980. The hallmarks are impressed on a silver plaque that has been soldered to the back of the angel's face. 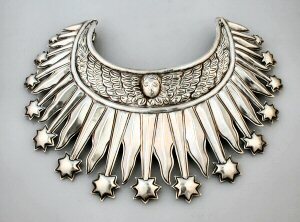 This entire necklace has been created by using a repousse technique and, in this design, there are no flat surfaces on the reverse side of the necklace on which to directly stamp hallmarks. My new book, Spratling Silver: A Field Guide - Recognizing a William Spratling Treasure arrived from the printer in late June. 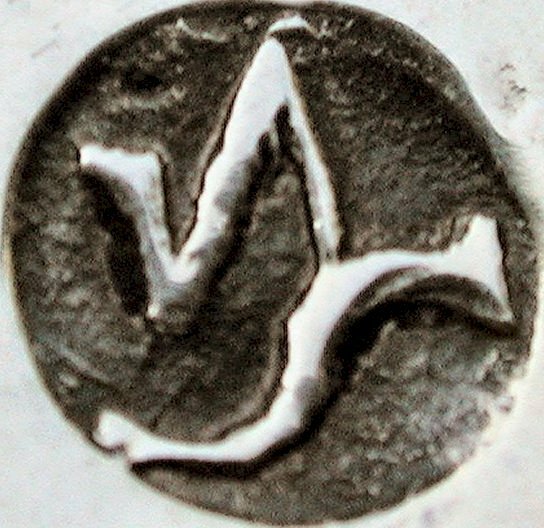 There is information on all hallmarks - plus all brand new material including photos of each of the recently researched verified hallmark variations. Full Color! More than 500 photos! You can read more - and order YOUR copy in our Book Store. The Maestros de Plate traveling museum exhibit is currently in Albuquerque. (See Current News for more information.) 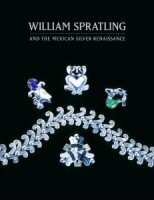 This handsome book, William Spratling and the Mexican Silver Renaissance is more than an exhibit catalogue. It provides exceptional information about 20th century Mexican silver - as well as photos and information about Mexico's new designers. If you have note seen the exhibit yet, or if the exhibit will not be traveling to a city near you, this book is the next best thing! Read more - and order a copy autographed by Penny Morrill - in our Book Store. Visit our Book Store for these and other Spratling related books!